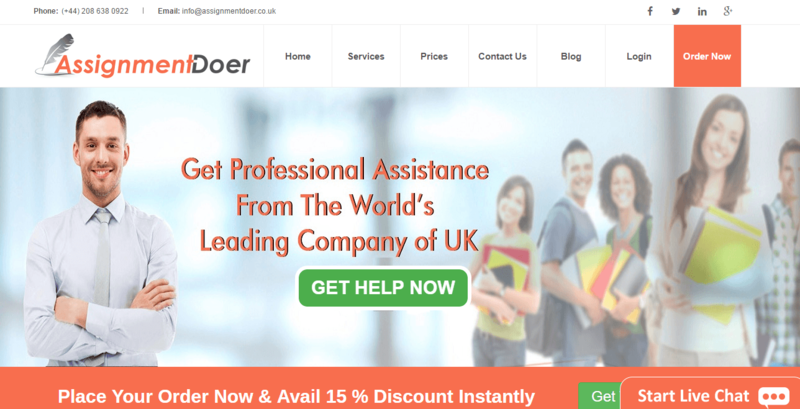 AssignmentDoer.co.uk calls itself ”the world’s leading company of UK’. In addition, the company promises numerous advantages to those who order their papers from the service, among which are lowest prices guarantee and satisfaction guarantee. This sounds like everything a student would need in a writing company, which is why we decided to perform an evaluation of the service. Candra Blair: They promise low prices and high quality content, but provide low quality content for high prices. Isn’t anyone checking these companies? Jessica Hutton: I don’t like assignmentdoer.co.uk. The paper they delivered was not of bad quality, but was full of plagiarism. After I sent it for a revision, the writer did a mess out of the paper. Now it is full of mistakes! Will I Find My Paper in the List of Services? The website has a separate ‘Services’ page that is full of irrelevant content and contains no list of services! We have been looking for the services this company provides everywhere on the website and concluded that the only place where you can see if they offer your type of paper is in the Ordering section. According to this list, the company offers all commonly requested papers such as essays, term papers, research papers, dissertations, dissertation chapters, theses, case studies, movie reviews etc. Once we saw the badge that said ‘lowest price guarantee’, we expected to see incredibly cheap prices in the Pricing page. Instead, we found prices that would be considered average when compared to those of other services. This makes the company very unreliable and companies that promote fake claims are considered highly unprofessional. An essay with a deadline of 7 days and Standard quality costs £11.99, while a dissertation with the same quality and deadline costs £19.19 per page. Lifelong and bulk discounts are non-existent on the website, except for the 15% off given to first-time customers. This discount is inviting and can reduce the price significantly, but applies only once. This makes the company a bad choice for those in need of regular content providers. The first thing we do when checking the quality of content is evaluating samples the company provides. However, AssignmentDoer.co.uk does not provide any samples on the website. They actually have a Blog on the website, but there is not a single post on it. Furthermore, there is a description under the name ‘Blog’ that says ‘Some Cool Page Description’, which is a joke we found to be very unprofessional. In order to check the quality of content, we decided to order a dissertation chapter. We paid a good price due to the first-order discount and got some good content too, but the chapter did not fit the remaining of the dissertation. Considering that the writer has done proper research and had good writing skills, we assume that they can deliver good content if you order a simpler assignment. However, a company that cannot follow guidelines and fit a chapter with the rest of a dissertation should not offer this service at all. Can I Contact the Service? You can contact the service via phone, email or the 24/7 live chat. The representatives work promptly and effectively, except for the email service. We waited 2 days to get a reply via email. AssignmentDoer.co.uk is not a trustworthy service since they promise many things that are obviously not true. The content we got was relatively good, but the writer failed to follow our guidelines. Furthermore, the lack of discounts makes us conclude that this service is not worth the rates they charge for academic papers.